An important aspect of encouraging exploration for the user is to maintain a certain amount of flexibility and customization, including multiple options, entry points to information and views. A more linear type of design would have specific questions and specific ways to get there. In a design meant to be explored, there should be some general questions the user would want answered and some kind of goal, but in what order they answer certain questions and how they get there should be flexible. This also allows the user to find unexpected information that could lead to further exploration. If the purpose or goal of the information is not immediately understood, it could be helpful to give some presets or suggested routes to find valuable information. The way that filters are set up in a flexible design is also important. They allow for exploration of the big or detailed picture. They should be readily available to be changed and allow for experimentation by being directly manipulated and giving immediate feedback. Without immediate feedback, users will be less likely to spend time exploring. Death of a Terrorist: A Turning Point? – A straightforward visualization in concert with an autoplay comment view and direct manipulation makes this example by the NY Times an excellent lightweight example of good exploration. www.wefeelfine.org – This is all about open-ended exploration. The purpose is simply observatory. 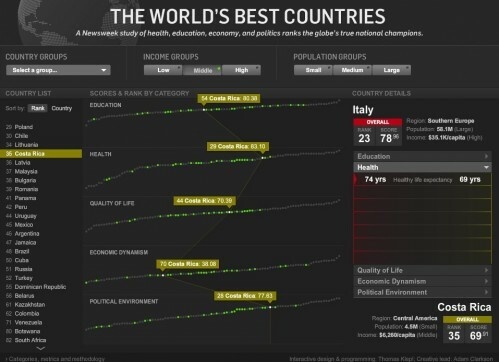 The World’s Best Countries – A consistent central visual with nice animation a direct filtering.